The 2019 edition of the White House Easter Eggs feature five styles and were all made by Maine Wood Concepts in New Vineyard, Maine. The five colors are supposed to represent five famous rooms in the White House. Thousands of colorful wooden Easter eggs are making the journey from Maine to the White House for this year’s annual White House Easter Egg Roll. For the second year in a row, Maine Wood Concepts, a wood turning factory located in New Vineyard, Maine, will turn out about 100,000 birch Easter eggs to meet the exacting specifications of the White House Historical Association. “Maine Wood Concepts has proudly made the collectable eggs multiple times over the last two decades and is extremely proud to play an important role in a time-honored American event,” said Michael W Conway, director of sales and marketing, for the company. The front of most of the eggs has a picture of the White House. 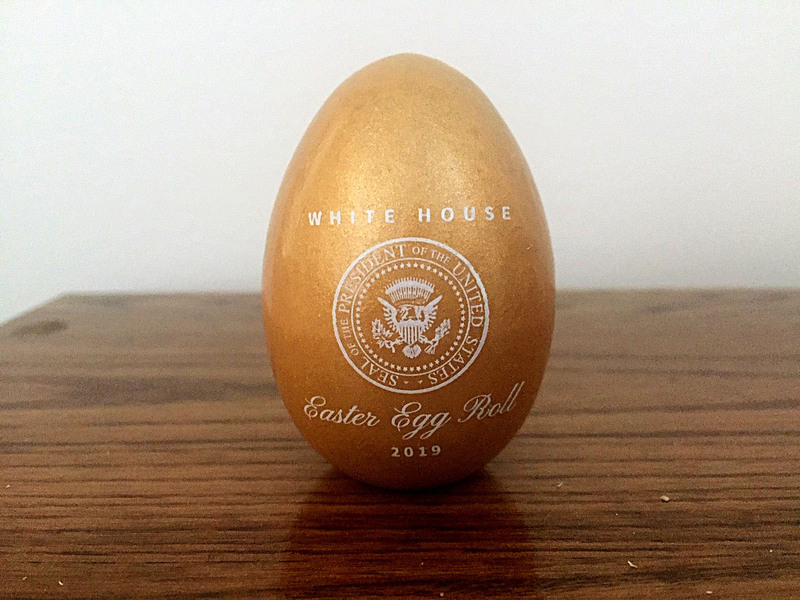 The gold eggs have a picture of the Presidential Seal. The reverse side of all the eggs has the signatures of President Donald Trump and First Lady Melania Trump. White birch logs used to make the eggs are harvested locally from FSC Certified forests and then processed at Maine Wood Concepts’ sawmill. Once the wood has been properly prepared, it is made into eggs, finished with multiple coats of enamel and imprinted. 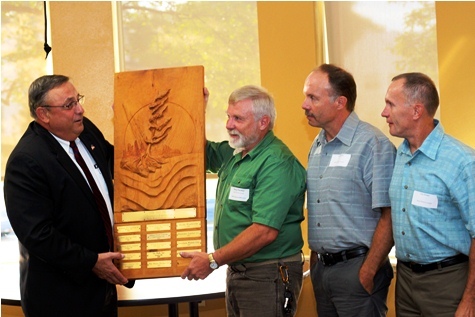 “All of this is done completely at the Maine Wood Concept facility in New Vineyard, Maine, for an exclusively Maine made product,” said Conway. This year’s edition of the eggs have five versions. Standard eggs feature a picture of the White House on one side and signatures of President Donald Trump and First Lady Melania Trump on the opposite side. They come in four colors: red, green, rose, and blue. A fifth style of egg is gold colored and has the presidential seal instead of a picture of the White House. According to the White House Historical Association, the Official 2019 White House Easter Eggs are inspired by the rich colors found in the White House State Rooms and gardens: the Green Room, the Blue Room, the Red Room, the Vermeil Room (gold), and the Rose Garden. The gold egg features the Presidential Seal and is colored to represent the Vermeil Room in the White House. 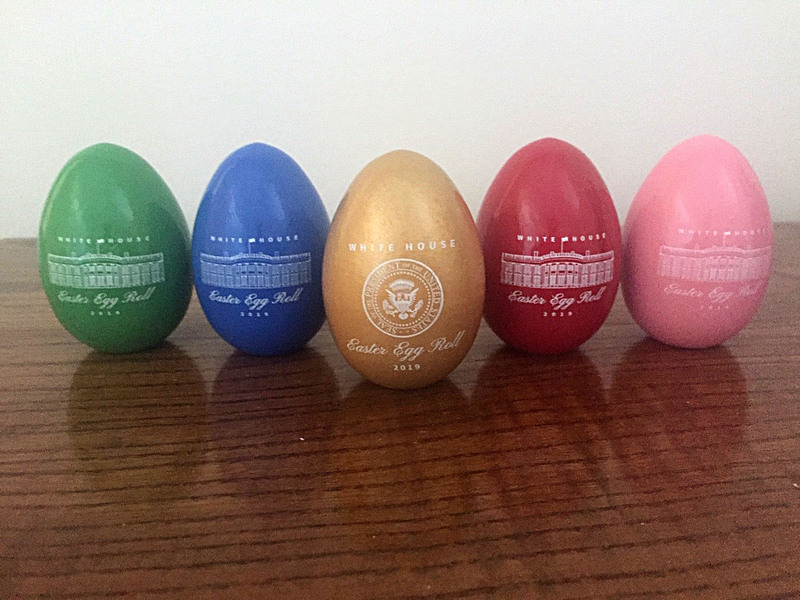 WHHA began selling the Official 2019 White House Easter Eggs on March 15, 2019. 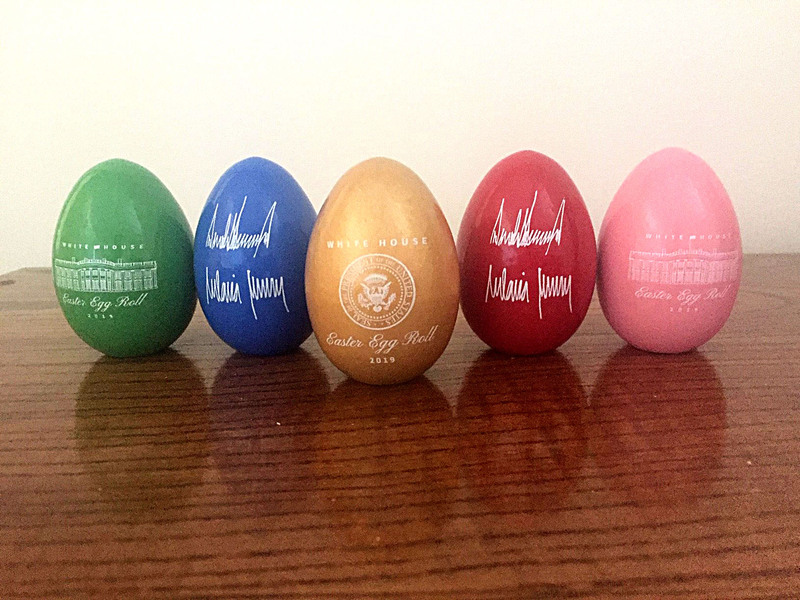 Additionally, the limited-edition wooden eggs will be given as gifts to children attending the White House Easter Egg Roll on April 22, 2019. 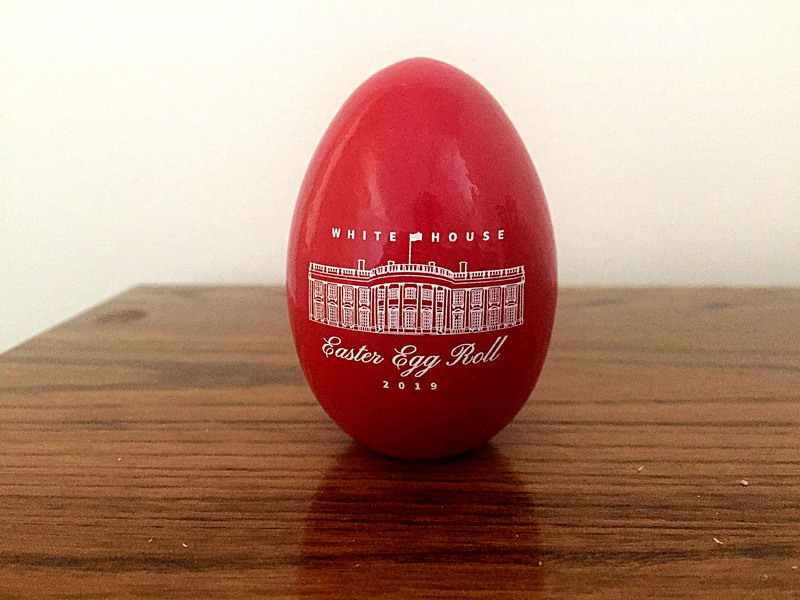 The eggs will be available for purchase to the public while supplies last at: https://shop.whitehousehistory.org/holidays/easter. The primary entertainment during this annual event has always been egg rolling. As the Egg Roll tradition evolved, wooden eggs have grown to replace real eggs, which created a foul odor and messy clean up when smashed. Today, wooden eggs, created and available exclusively through The White House Historical Association, are used in the White House Easter Egg Roll and given as gifts to children attending the event. Grover Cleveland hosted an audience of children for both his terms in office. In 1885, children with baskets of brightly dyed hard-boiled eggs were reported by The Washington Post to have ruined the East Room carpet with broken egg shells and smashed hard boiled eggs. Maine Wood Concepts makes about 100,000 eggs for the event, starting production months ahead of time. To make the White House Easter Eggs, Maine Wood Concepts typically starts production months in advance. The company employs about 95 people making a wide variety of turned wood products usually from domestic hardwoods. Products range from salt and pepper shakers to toy parts, tool handles, and parts for furniture. For more information regarding Maine Wood Concepts, visit: www.mainewoodconcepts.com. Maine Wood Concepts Buys Vic Firth Gourmet Co.